Nowadays, one of the most serious health issues is cancer. In order to win the battle against it, your immune system must be in a perfect condition, and your body must be balanced. One of the ways in which anyone can take steps to reduce their risk for cancer is by eating the right foods. Effective natural foods can be preventive agents that help destroy cancer cells at the base level and boost overall well-being. This article lists 12 superb foods which should be incorporated in your daily diet in order to help fight off cancer and improve your overall health. Numerous studies suggest that curcumin, a component of turmeric, kills tumor cells by regulating multiple cell-signaling pathways. You can add turmeric to any dish: scrambled eggs, chicken, and anything you wish, and enjoy its benefits. Dark chocolate is abundant in antioxidants, polyphenols and proanthocyanidins. 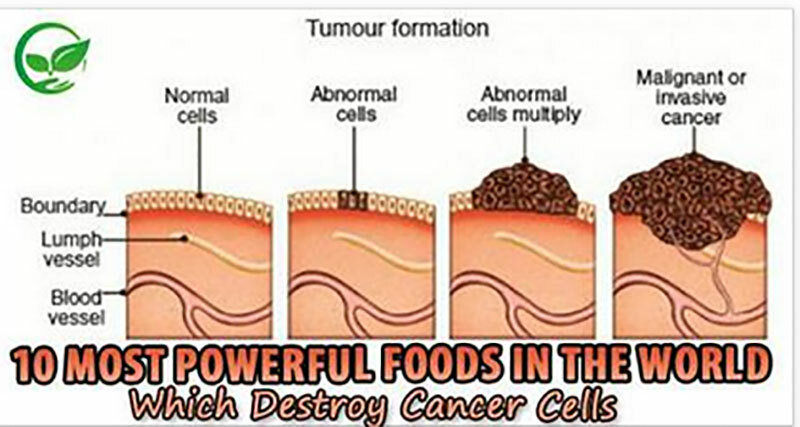 These substances limit the growth of both cancer cells and the blood vessels that feed those cells. Nevertheless, note that only the dark chocolate containing at least 70 percent cocoa offers these health benefits. There are several reasons why you have to embrace garlic and add it to more of your dishes. It has numerous antibacterial properties, and research suggests that it can help the body ward off cancer in a number of ways, including killing the cancer cells outright. Moroever, garlic is also able to help to stop cancer cells from multiplying and spreading and to repair the damage done to the DNA. Tomatoes are extremely effective anti-cancer super food, and it is even more effective when cooked. Namely, they contain Lycopene, which is known to kill mouth cancer cells and is linked to reduced risk of breast, prostate, pancreas and colorectal cancers, and a number of antioxidants which attack cancer-triggering free radicals in the body. Extra Virgin Olive Oil is one of the healthier oils you can have in your home. It can help to protect against several types of cancers, such as colon cancer, breast cancer, and prostate cancer. Cherries contain perillyl alcohol (POH), which has been found to be effective at destroying a variety of cancer cells in vitro and in vivo. Whenever possible, always choose organically grown fruits since they, unlike conventionally grown ones, do not contain pesticides and other chemical compounds. Catechin is an agent that has been shown to protect cells from free radicals associated with cancer that can damage their DNA, and it is found in large quantities in green tea. Note that the release of catechins is best from loose leaf tea. Just about all types of berries – including strawberries, blueberries, blackberries, cranberries and raspberries – contain substances called ellagic acids and polyphenols, both of which can slow the growth of tumors. Some of the polyphenols can also help kill off cancer cells. Regular consumption of cauliflower has numerous health benefits, as it can increase your liver’s detoxification capacity and immunity, help you avoid catching a cold, and prevent scurvy and also remove some type of cancer. It contains various minerals, such as calcium, iron, phosphorus, copper, and manganese and proteins, lipids, sugar, vitamins. The pumpkin has cancer blocking properties which are well- known. Moreover, you should eat the seeds as well, as they contain plenty of Vitamin E, an antioxidant that helps to defy cancer. Eggplant contains various alkaloids, of which solanine and cucurbitacin have been shown to possess cancer-fighting abilities. There is a growing number of studies which suggest that the eggplant has extremely potent anticancer functions, especially in the treatment of stomach cancer and cervical cancer. Carrots fight many forms of cancer due to the high levels of Beta Carotene, including intestinal, bladder, prostate, lung, stomach, breast, throat and mouth cancer. However, in order to obtain best effects, you need to consume them raw. Also, they are high in sugars, so eat them in moderation.